Although the calendar says late February, with many unseasonably warm days, the weather suggests a later month. Our adult falcons, Rebecca and Kewpee have, as in previous years, stayed on territory all winter. They are now visiting the nest box multiple times a day and both have been scraping the gravel in the bottom of the box to create a shallow depression where, hopefully, eggs will be laid in late March. They are also actively courting. Kewpee will catch prey and bring it to the nest box where Rebecca will swoop in and carry it off. He is demonstrating that he is a good provider and capable of supporting the family with food. He has certainly been a good provider the last two years. 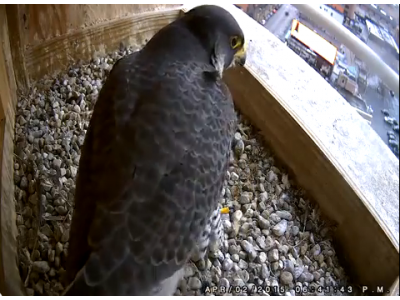 When there are chicks in the nest, the male Peregrine will go out to hunt, and will return and hand off the catch to the female, often in mid-air. She will then feed the chicks. Last fall, we installed a ramp in the window well below the nest box area. The intent is to provide a way for any errant young chick that should fall into the window well to walk up to the top of the parapet and rejoin his family. The last two years, we have had a youngster stuck in the bottom of the window well, which is about 5 ½ feet deep. It is impossible for them to fly straight up or for the parents to reach them. It has required human intervention to get the chick back to safety, but that poses a chance of spooking the other chicks and we don’t want to risk them falling off the building. From the parapet cam, you can see the top edge of the ramp on the far side of the nest box.